The criterion for success for any trade union campaign is whether or not it leaves organisation weaker or stronger. A hundred years ago, the German socialist, Rosa Luxemburg, observed that trade union organisation was a “labour of Sisyphus”, comparing it to the mythological figure who was doomed to an eternity of pushing a rock up hill, only for it to roll back to the bottom each time. It is certainly true that the nature of capitalist competition between companies means that the commercial context that businesses operate in is always changing, and that in the final analysis there is a conflict of interest between employers who wish to get more work for less money, and employees who wish to be treated with dignity and respect, and to be paid a fair wage. In that respect no negotiated deal is ever final, and the process of industrial relations is never ending. However, unlike Sisyphus, trade unions can grow and become stronger through that process. It is through the very process of collectively organizing around grievances, or campaigning to improve pay and terms and conditions, through using creative collective pressure to impose upon employers, that trade union capacity is built. As trade union members step forward to be shop stewards to organize and persuade their work colleagues, as they educate and inform themselves, and become educated by their union, as they share experience and network with other activists, participating in the democratic processes of their union, then that builds capacity and workplace strength. It is by this standard that we should judge the decision by Community, the relatively small union with its historical base in Iron and Steel, to sign a single union sweetheart deal with ASOS, and XPO logistics, who have been the focus of a campaign by GMB for the last two years. Organisation at the Barnsley distribution centre has been built by GMB. It is GMB who have a network of stewards and activists. Community has nothing. The most bizarre aspect is that reportedly, ASOS has signed all of their staff into membership of Community, with the subscriptions free for six months. Individual members have to inform HR if they wish to leave. Clearly, it is no longer lawful for an employer to require a member of staff to be a member of a particular union, which explains why individuals are being given the option of leaving. But at the end of the six month period, what will happen? Community’s collusion with ASOS to seek to derail the GMB’s campaign is frankly scabbing. Just as EETPU were expelled from the TUC for organizing TNT workers at Wapping to empower a scab operation to break the print unions, Community have stepped over the line, and should face the consequences. Is it time to review the Bridlington agreement? Posted in: Economy, Politics, Trade Unions. Brexit forecasting: Who’s to blame? Well you know what they say, one comrades scabbing is another’s healthy competition. Inter-union squabbles are an unedifying sight. It is interesting to compare that statements by the two unions: GMB; Community. 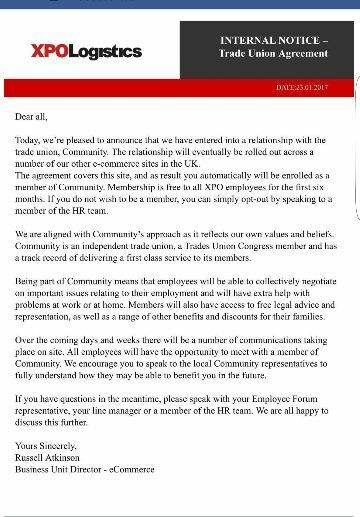 The most important thing, as far as I can make out, is that Community appear to have concluded this deal over the heads (behind the backs of) the workers concerned. I agree David. Poaching battles have been rare in recent times and with all unions being under attack, but there have been some examples. In schools Unison regularly complains about ATL recruiting support staff, although with the likely merger of ATL and NUT later this year to creat the National Education Union (NEU) which would be the fourth largest union in the UK and open to all education workers this conflict is likely to escalate further if NEU demonstrates its effectiveness at pushing back the attacks on the education sector. But ironically, at exactly the same time that Dave Prentis was writing to the TUC complaining about ATL, Mark Sewotka was writing to the TUC on behalf of PCS complaining about Unison who had signed a sweat heart deal with Francis Maud to give Unison access to recruiting civil servants at a time when PCS was fighting for its life against wave after wave of government attacks, cuts, job losses and ripping up of union agreements and facility time arrangements for reps.
Community has always been an odd little union (and with only around 30,000 members little sums it up). When Thatcher had finished destroying most of the British steel industry and privatising the rest over 30 years ago the then ISTC found itself with a a small membership but a very healthy bank balance due to the previous wage rates and high union subs of its members, which in turn enabled it to resist a merger with one of the large generalist unions. Instead it tried to become a generalist union itself, with initially at least some good ideas of organising in areas of low or non-existiant union membership (from betting shop workers to home workers). but these had limited success, although it did manage to merge with a couple of smaller specialist unions (including the National League for the Blind and Disabled whose pioneering and courageous fights for equality and rights for disabled workers is now sadly often forgotten). But being a small but relatively well off union enabled the executive and general secretary to dominate the membership and key to this in relation to the Labour Party was how they developed, like the USDAW leadership, into the most right-wing Labour Party affiliate (and currently of course anti-Corbyn). It was then only a short step to become, like the old EEPTU, a scab union as this example of a sweetheart deal with an anti-union employer shows. Well Community as a union have little in common with the people they purport to represent and more in common with businesses their members work for.